A claim made this decade that ‘Arabs don’t read’ raised concerns among civil society and authorities in the Arab countries which resulted in growing research to investigate this claim and major initiatives to promote reading among Arabs. 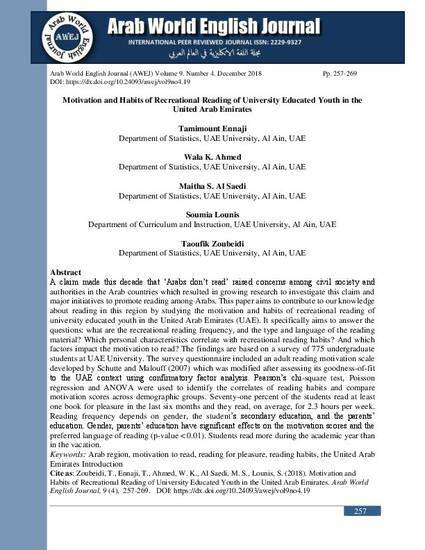 This paper aims to contribute to our knowledge about reading in this region by studying the motivation and habits of recreational reading of university educated youth in the United Arab Emirates (UAE). It specifically aims to answer the questions: what are the recreational reading frequency, and the type and language of the reading material?  Which personal characteristics correlate with recreational reading habits? And which factors impact the motivation to read? The findings are based on a survey of 775 undergraduate students at UAE University. The survey questionnaire included an adult reading motivation scale developed by Schutte and Malouff (2007) which was modified after assessing its goodness-of-fit to the UAE context using confirmatory factor analysis. Pearson’s chi-square test, Poisson regression and ANOVA were used to identify the correlates of reading habits and compare motivation scores across demographic groups. Seventy-one percent of the students read at least one book for pleasure in the last six months and they read, on average, for 2.3 hours per week. Reading frequency depends on gender, the student’s secondary education, and the parents’ education. Gender, parents’ education have significant effects on the motivation scores and the preferred language of reading (p-value < 0.01). Students read more during the academic year than in the vacation.